Hello beautiful! Welcome back to another topic of fun DIY project and I hope you guys are as excited as me! I believe that everyone has that similar black or white earphone which is so boring and lame. So, in today’s topic, I thought it would be a great idea to share with you some awesome ideas to personalized your earphone and prevent them from getting tangled. 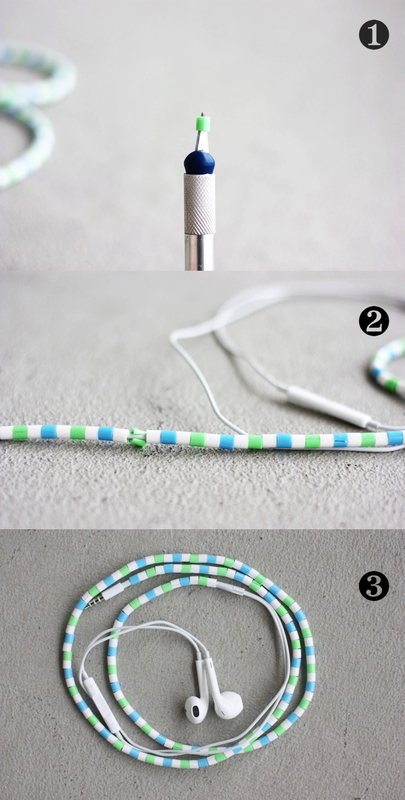 Here are some few examples of chic DIY earphones from talented bloggers and it looks really beautiful! Colorful DIY embroidery headphones! 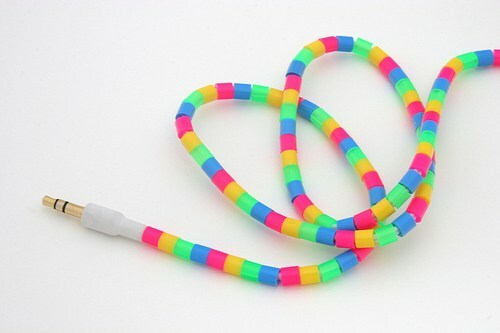 They are not just beautiful but also keeps your headphone from getting tangled. 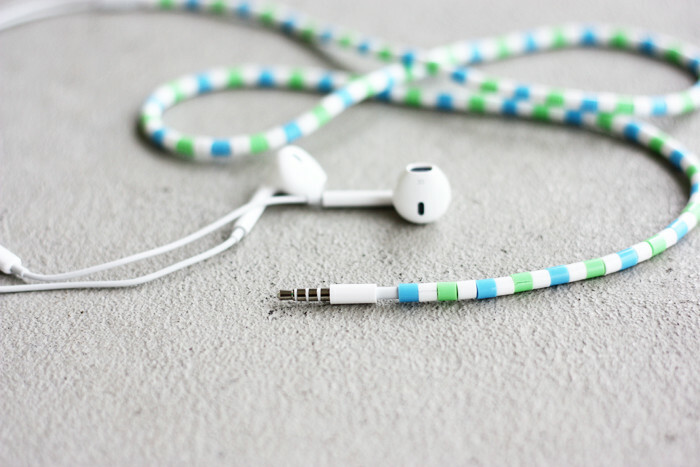 Personalized earphone cables by using hama beads. 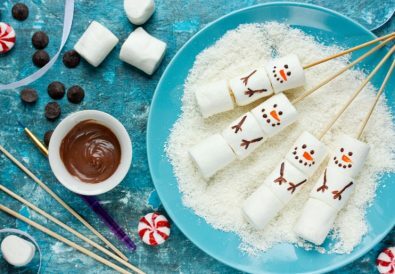 Simple but nice! This pastel color embroidered headphone cable is sooooo pretty and cute! 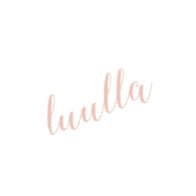 You’ll love it if you’re a huge fans of pastel hues. 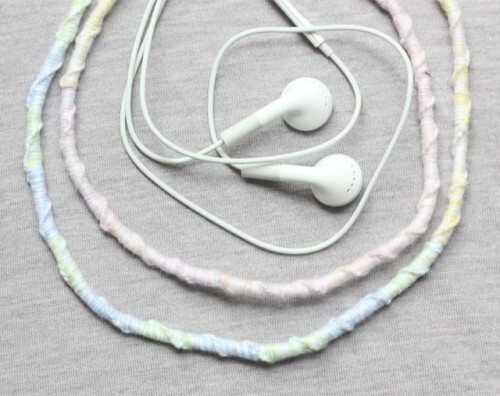 By twisting your embroidery floss over and over around your earphone cables will create this amazing twist effect! Don’t you wish you could bring rainbow around you whenever you go? 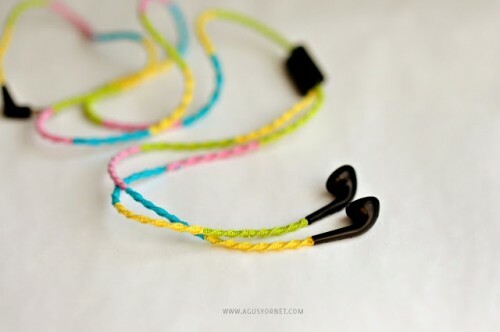 Here is a colorful rainbow earphones which you should definitely try to make one now! Begin with making a single cut through the hama beads using a pair of scissors or exacto knife. Let the bead remain on the scissors and push it onto the earphone cable. Keep doing so until your earphone cable is fully decorated with hama beads. And that’s pretty much it! Start with pinning your earphone to a pillow with safety pin. It will ensure the earphone secure in place. Pick 2 colors of embroidery floss, then, tie a knot at the top of the headphone (right below your earbud). Cut the two embroidery floss for about an arm’s length. 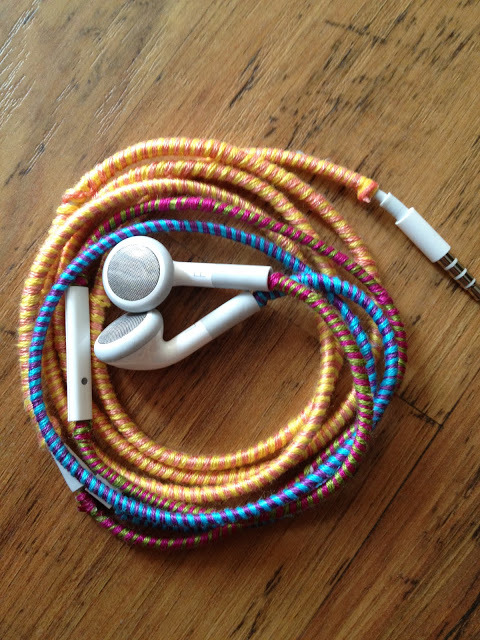 Now, keep two colors together and start wrapping around the earphone cable. As you wrap your earphones, remember to keep pushing the embroidery floss up so that there’s no gap in between. Also, make sure you’re wrapping it tightly. Once you’ve reached to the end, tie 2 knots at the end to secure the embroidery floss. Cut off the excess embroidery floss. Lastly, dab the knots (starting point and ending point) with some nail polish to make sure it wouldn’t unravel. Tadahh! That’s it! Pin your earphone to a pillow with safety pin to make sure the earphone is secure in place and doesn’t move around when you’re DIY-ing. Pick 2 or more colors of embroidery floss, then, tie the floss to the end of the earbud. Cut the embroidery floss for about double the length of the earphone. Here, we’re going to start making chinese staircase embroidery. Hold one color in one hand and the rest in another hand. Cross one string over the rest of the strings, just like the shape of a “4”. Take the end of the string and cross it behind the rest of the strings, pull it through the loop to form a knot. Pull the knot tightly and push it up every time you made each knot. Keep doing in the same manner until you’ve reached the end. Once you’ve reached the end of the earphone, tie a double knot to secure it in place. Cut off the excess threads. Lastly, dab some nail polish at each end to ensure it wouldn’t unravel. There you’ve got yourself a personalised earphone! That’s all for today’s topic and thanks for reading! 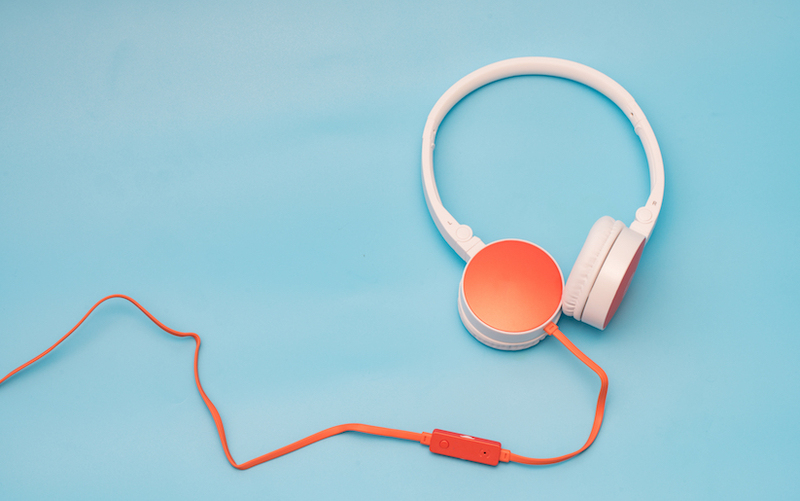 I hope you’ll find it interesting and most importantly – say buh-bye to your boring earphone and hello to cool and awesome personalised earphone! If you like this blog topic, do share this with your friends so you guys can start doing it together.